More public participation might help. So might ULURP. But rigorous skepticism is more important. It was fascinating, having watched in 2004 and 2005 two New York City Council subcommittee hearings on the announced Brooklyn Atlantic Yards project, to see the Council's Committee on Ecomomic Development, with the Speaker prominent, on December 12 take a distinctly adversarial stance toward the proposed Amazon campus in Queens. Back then, not only were the Governor and Mayor gung-ho for “jobs, housing, and hoops,” many Council members, despite their questions, were essentially enthusiastic. Meanwhile, the developer and supporters got significant time from the hearings’ start, relegating opponents to later slots. And it was curious to hear both proponents and opponents of the Amazon deal rather tritely invoke lessons from Atlantic Yards (now called Pacific Park), suggesting the need for either broader public participation or the importance of the city’s Uniform Land Use Review Procedure (ULURP), which gives the Council the final say (rather than using the state General Project Plan, which puts the Governor in charge). Don’t get me wrong: neither broader participation nor ULURP are necessarily bad things. But they’re hardly saviors when big money and powerful players are at work, and when projects unfold over time and multiple economic cycles. For example, promises made in Memoranda of Understanding (MOUs), or even in state approval documents, as we’ve learned, can be followed by contracts that offer crucial slack. For example, the fine print allowed Atlantic Yards, estimated to take ten years, a 25-year buildout. So, while these massive development projects differ significantly, the Atlantic Yards experience makes clear that, as the Amazon deal unfolds, more muscular, and consistent, skepticism and oversight is needed. We’ll see how much surfaces at the next hearing, held by the City Council's Committee on Finance, scheduled for January 30. “Now, I don't agree with Dan Doctoroff on everything, but I thought that was an interesting comment,” Johnson continued, pressing Patchett on “why it was important…to facilitate the subverting” of ULURP. Patchett replied that the “UDC Act”—referring to the Urban Development Corporation, the state authority that can override local land use—“is available to do more comprehensive planning,” and is “more powerful” than ULURP for certain projects. Certain things, he said, can’t happen with ULURP, like having the state hold title to project land. Hmm—similar tactics were used with Atlantic Yards, but Doctoroff, in retrospect, would’ve used ULURP. So when Patchett said the city’s primary focus was getting the promised 25,000 jobs, it sounded like the end justifies the means. “More powerful” also translates as “certain passage by appointees who answer to the governor.” With Atlantic Yards, that meant not only initial passage of the project, but steady agreement regarding revisions of the timetable and thus promised public benefits. Empire State Development, the successor to the UDC, has, in my observation, steadily affirmed the governor’s (and developer’s) will regarding Atlantic Yards. Only at state legislative oversight hearings have ESD officials faced hard questions. That key state authority, we should remember, avoided the first City Council hearing on Amazon, just as it sidestepped those Atlantic Yards hearings held by the Council. Pre-empting the Community Advisory Committee (CAC) announcement, state Senator Michael Gianaris and Council Member Jimmy Van Bramer announced on November 21 that they would boycott such a body, calling it “a thinly veiled attempt to present the Amazon development as a fait accompli.” That’s hard to doubt, though it is possible that the CAC -- supposed to advise on issues like workforce development -- could have some impact. The CAC has 45 members (though one’s already resigned), appointed in consultation with local elected officials and stakeholders, and is supposed to meet quarterly; its three subcommittees -- including one that will advise on local infrastructure spending -- are supposed to meet monthly. Town halls should be held two weeks after each quarterly meeting, reported Christine Chung of The City. That could add some sunlight. Given the very low bar, this has more legitimacy than the Atlantic Yards CAC, which was not set up until some 28 months after the project was announced and barely met. When Atlantic Yards opponents, in a lawsuit challenging the project’s environmental review, called the CAC illegitimate, a judge disagreed, saying the law is so slack it’s even legit to establish such a committee after a project is approved. A somewhat transparent CAC also seems better than the Atlantic Yards Community Benefits Agreement (CBA), a private contract that purported to guarantee such things as job-training and affordable housing, but had crucial loopholes; for one thing, the developer never hired the required Independent Compliance Monitor. The CBA was used as a political wedge. The developer gained support from groups -- some with track records, others astroturf -- led in large part by black leaders in Central Brooklyn, who had legitimate grievances about past developments and could help a large corporation to argue that middle- and upper-class opponents living closer to the project site, largely white, were selfish NIMBYs. So it’s surprising that Amazon has not already organized some Queens stakeholders to vouch for the company’s intentions to lift up some of the borough’s struggling precincts. After all, Amazon has already taken a page from the big-developer playbook, buying ads in the tabloids (and mailing several flyers to New Yorkers) repeating, for example, the dubious claim that the project would bring $27 billion in new tax revenues. Keep in mind that even seemingly robust public consultation may only go so far when the state’s in charge. In 2014, a volunteer body, the Atlantic Yards Community Development Corporation (AY CDC), was set up to advise ESD, as part of a 2014 settlement to avert a potential lawsuit on fair housing issues. However, it’s mostly toothless. A few now-departed AY CDC members have raised questions about the project, while most -- the board is controlled by the governor -- are there to nod yes. Though the AY CDC is supposed to meet quarterly, last year it held its second meeting -- essentially to support an ESD contract renewal -- with just one day’s notice on March 30, and hasn't met since. Well, not quite; some people adamantly opposed the arena (now Barclays Center), or the project’s density. But ULURP would at least have put the debate in the public sphere, and empowered the local Council member, then Letitia James. It should be noted that the two Council committee hearings regarding Atlantic Yards came under the leadership of then-Speaker Gifford Miller. After the project was approved, while the Speaker was Christine Quinn, known for her closeness to Mayor Michael Bloomberg, the Council wouldn't green-light future oversight hearings requested by James and colleague Brad Lander. Today, compared to the Atlantic Yards history, the Council Speaker is less beholden to the mayor; the economic impacts of the 9/11 attacks are more distant; we don’t have the distraction (and lure) of professional sports; and we’ve seen the explosion of gentrification near the waterfront. Moreover, Amazon is a lightning-rod company, to say the least. Yet, Johnson surely knows that ULURP is its own political game. Consider the Council’s recent approval of a giant two-tower project, 80 Flatbush, at a site that bridges Downtown Brooklyn and low-rise streets. After the project’s developer sought to nearly triple the allowable density, Council Member Steve Levin expressed concern, while the local community board was staunch in its opposition. Eventually the project was approved with only modest reductions, and Johnson, according to Levin, was very much in the loop. While the public learned a lot about the expected benefits -- affordable housing, a replacement school, a new school -- ULURP never ventilated a key question: the value of the additional square footage the developer gained via an upzoning. Last September, Council Member Lander offered some cogent criticism before the Council-spurred 2019 Charter Revision Commission, suggesting that, with challenges like affordability, sustainability, and aging infrastructure, “our highly reactive ULURP process just is not getting the job done." A broader effort at planning might have put the city and state “incentives” (subsidies) in context. Sure, we’re not necessarily shoveling cash, outside a state construction grant that could be worth $505 million, as a special favor to Amazon, given that most of the subsidies are as-of-right and performance-based. But some dialogue and data might clarify, as critics have argued, whether such subsidies are wise and deserve to be perpetuated. After all, Amazon admitted that the prime, not sole, driver was the talent pool. There are also other murky parts of the deal, such as a seemingly low fee for public land and generous lease terms, as I wrote last month for Gotham Gazette. It was interesting to see Speaker Johnson scorn the state projections that saying Amazon would be a financial boon for the city and state, and argue for an independent study. New York has a vehicle for such analysis; it’s called the city’s Independent Budget Office and, when called in 2005 and 2009, IBO raised serious skepticism about Atlantic Yards (and should probably do an update). With that project, however, government officials and many in the press embraced a study paid for by the developer, which was wrong from the start and which is now clearly way off (in part because the project wasn’t built in ten years). Another analysis is needed, too. At one point during the Amazon hearing, Council Member Francisco Moya requested an independent study to report on such things as the project’s economic, infrastructure, and housing impact. The NYC EDC’s Patchett, nonplused, responded that, of course, the state process requires a study. But that’s not a truly independent study. In projects like Atlantic Yards, such environmental reviews, however sufficient to pass legal scrutiny, serve the interests of the project’s sponsors and the agency boosting it. The Council could fund a such an independent study. Sure, this doesn’t address the question of Amazon-the-company, with business practices that, to some, disqualify it. But, at the very least, if the chief executives of New York City and State are going to offer pre-cooked ambitious plans, the obligation of the legislative branches should be continued oversight. Norman Oder is a Brooklyn journalist who writes the watchdog blog Atlantic Yards/Pacific Park Report. On Twitter @AYReport. A May Politico profile of New York City Public Advocate Letitia (Tish) James, the front-runner in the upcoming election for state Attorney General, noted that “she has occasionally shown a flair for exaggeration, which has periodically raised questions about her credibility.” Cited were statements about her age and her claim of credit for a New York Times series on homelessness. Indeed, I’ve witnessed such exaggeration. Perhaps it’s carelessness, coupled with confidence in her undeniable charisma. Perhaps it relates to James’ alternative career choice of the ministry (as she once told an interviewer), in which parable can trump precision. But as James moves up the professional ladder, such hyperbole gets more hazardous, especially as she asks voters to make her the state’s top legal officer. Taking Atlantic Yards to the U.S. Supreme Court? At the August 15 Democratic attorney general candidate forum sponsored by Indivisible Harlem (at about 55:20 remaining on this video) James responded to a question about the city’s investigation of yeshivas said to be offering an inadequate secular education and got on a riff that segued to Atlantic Yards. The moderator intervened, reminding James that the question concerned yeshivas. So, while the case was brought to the Supreme Court, it wasn’t heard by the Supreme Court. More importantly, Council Member James as an individual played, at best, a supporting role. She was neither named plaintiff nor participating lawyer. Did that case “almost bankrupt” Forest City Ratner and developer Bruce Ratner? That’s a bit of a stretch, though Atlantic Yards -- conceived in optimistic times before the recession -- certainly caused major financial pain. Also, neither Forest City Ratner nor Empire State Development, the state authority overseeing and shepherding the project, were "foreclosing on homes," or taking homes from borrowers in default. James would better have said that, with the threat of eminent domain, the developer was squeezing—and buying, with significant public dollars—people out of their homes. What about that Holocaust survivor? James at least once has dubiously expanded that reference, as I wrote in September 2012, as the Barclays Center was opening, about a TV interview with James. "The issue is really about standing up and advocating for your community...against the abuse of all is right,” she said. “This woman I know, and I'll always remember her, lived in footprint, she was a Holocaust survivor. She wanted to die in her home. She was 89 years old. She should've been allowed to die in her home and not suffer under the stress of being subject to eminent domain for a basketball arena." I checked with two people who should know, and was told the elderly Holocaust survivor who was stressed by eminent domain was a commercial tenant, not a residential one. No one remembers -- and I asked again this week -- a residential tenant who was a Holocaust survivor. Yes, an elderly woman in the footprint, Victoria Harmon, didn't want to move, and did end up dying at home, but she wasn’t a Holocaust survivor. This past Tuesday, during a Democratic attorney general candidate debate that aired on Manhattan Neighborhood Network, James brought up Atlantic Yards again. “I took that [eminent domain] case all the way to the Supreme Court," she said at one point, soon amending the claim to “We." As I wrote on Twitter, James deserves credit for promoting or participating in several Atlantic Yards cases, such as the environmental review case (in the photo at top), but not the claim as stated. She was a named plaintiff in two lawsuits: one challenging the Metropolitan Transportation Authority’s willingness to relax a deal with developer Forest City Ratner, and another challenging the state’s 2009 re-approval of the project, which ultimately led a judge to criticize Empire State Development, the state authority overseeing the project, and to order a new environmental review. Was my criticism, as one James supporter tweeted, “strangely nitpicky”? I don’t think so, especially if it’s part of a pattern. James also exaggerated in her statement at a April 30 public hearing concerning a controversial two-tower project near Atlantic Terminal in Brooklyn called 80 Flatbush. James had ample reasons to be wary of 80 Flatbush, notably what Assemblymember Jo Anne Simon and state Senator Velmanette Montgomery have called the request for an “unprecedented” tripling of allowable density. But James went beyond criticism to fable. "Atlantic Yards down the memory hole" is a phrase I coined to describe how the facts and history of the controversial real estate project -- which was renamed Pacific Park Brooklyn in 2014 -- regularly get mangled by journalists, public officials, and commentators, often buffing away the controversy so that people may eventually wonder why anyone ever cared. Part of that surely relates to the project's complex, twisting path, with at least 11 more towers yet unbuilt, joining the Barclays Center and four apartment buildings. It's tough to get right, even for me, and I write about Atlantic Yards/Pacific Park every day. Also, the documentary record includes newspaper articles and government statements that either were initially flawed or no longer remain correct. Add the pressure of tight deadlines, with little time (or perhaps inclination) to check on, say, whether an old New York Times article was superseded by new information in the mainstream press, or corrected by a blog they don't read. It's doubly dismaying, though, when book authors err, because they presumably have more time for research and because a hardcover presentation adds gravity. Unfortunately, interesting new books on the Bloomberg and de Blasio administrations get the Atlantic Yards/Pacific Park history wrong, in both small and significant ways. It's understandable that the authors give Atlantic Yards/Pacific Park short shrift, as it's but one controversy within a complex set of governing challenges, and authors have to pick their spots. It doesn't ruin these substantial books. But it suggests they've not given careful attention to this project. Only former Bloomberg Deputy Mayor Dan Doctoroff, in his Greater Than Ever: New York's Big Comeback, adds some new insights, but his triumphant narrative ignores some countervailing evidence. Some authors make simple, though telling, mistakes, likely from sloppily surveying a clip file. 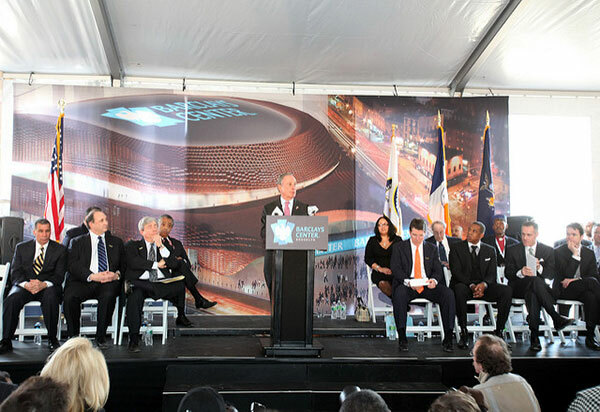 Writes Chris McNickle, in Bloomberg: A Billionaire's Ambition, "Forest City Ratner, a national real estate firm, built the Barclays Center...on top of gritty MTA-owned railroad tracks." Put aside that Forest City Ratner was the New York arm of a national firm -- then Forest City Enterprises, now Forest City Realty Trust -- the arena was not built fully on (or over) the MTA's Vanderbilt Yard. The arena was built partly on the railyard. The tracks in the way were moved. The other half of the arena footprint involved private (plus city/MTA) property and public streets. Had the arena site been limited to the railyard, Atlantic Yards wouldn't have sparked years of controversy and a battle over eminent domain to deliver some of that private property. This error appeared frequently in the Times and other media outlets, and was only occasionally corrected. Probably the most egregious example was the enthusiastic appraisal of the original 2003 plan by Times architectural critic Herbert Muschamp, who wrote, "The six-block site...is now an open railyard." 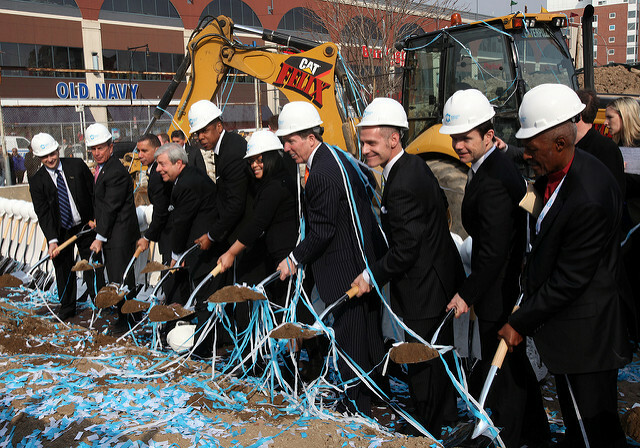 McNickle, to his credit, locates the Barclays Center "near Downtown Brooklyn." Doctoroff uses "Downtown Brooklyn" without the modifier, as do Joseph P. Viteritti, in his The Pragmatist: Bill de Blasio’s Quest to Save the Soul of New York, and Juan Gonzalez in his Reclaiming Gotham: Bill de Blasio and the Movement to End America's Tale of Two Cities. The Times used that location a lot, but it also published a correction back in 2006 indicating that almost all the project site was in Prospect Heights. This might be seen as splitting hairs -- today, it could be argued that the Barclays Center extends the boundaries of Downtown Brooklyn, long seen as ending near the Williamsburgh Savings Bank, across Atlantic Avenue. But the key issue is that the Atlantic Yards site was separate from Downtown Brooklyn, which New York City rezoned for high-rise buildings. After all, exiting from the back of the Barclays Center, you see Prospect Heights row houses across the street. Even Gregg Pasquarelli, the architect who redesigned the arena, called it "a big building in a residential neighborhood." The overall amount of direct and indirect subsidies for Atlantic Yards/Pacific Park remains murky, in part because the project's not finished. But these books don't help. "The city contributed $100 million in cash, infrastructure support, and tax abatements to the private project," writes McNickle, not specifying the value of the latter two categories. The New York City Independent Budget Office (IBO) estimated a package far more valuable than $100 million. Writes Doctoroff: "When the financials of the deal deteriorated, the city and state upped our [cash] contributions to the project to $100 million apiece." Actually, beyond that $100 million, the city later assigned $105 million to Atlantic Yards. Though city officials protested that a good chunk of that would have been delivered anyway -- and the IBO cautiously assessed a $150 million city total -- Forest City itself claimed it had secured $105 million more. Why does that larger figure matter? Because the IBO, which in 2006 estimated that the arena would represent a net gain for city taxpayers, in 2009 projected a loss, based in part on new subsidy numbers. That goes unmentioned in Doctoroff's book, though the city, which embraced the earlier IBO assessment, attacked the later one. The overall impact remains inconclusive. Beyond that, Doctoroff writes that, for the new Yankees and Mets stadiums, and the Brooklyn arena, "the city would fund only infrastructure costs, the stadium had to be financed by the team." Putting aside the controversial financing methods -- PILOTs, or payments in lieu of taxes -- that's not true regarding the Barclays Center. The city's initial $100 million pledge could be used for infrastructure or for land purchases and, ultimately, it was used to buy arena land. In fact, Forest City's seemingly generous buyouts of condo owners -- prompting a front-page 2004 Daily News headline, "BONANZA," subtitled, "Brooklyn apt. owners offered $1 million-plus to make way for Nets arena" -- were funded by taxpayers, as I reported four years later. "Because the project stood mostly over state controlled land," writes McNickle, "the city's normal review process did not apply." It's hard to fault him for conveying that typical explanation from public officials, though such state land is actually a plurality, not a majority. Then again, some critics, including former City Planning Commissioner Ron Shiffman, long argued that the city could have negotiated with the Empire State Development Corporation, the state authority (since renamed Empire State Development) that wound up overseeing Atlantic Yards, to use the city's more substantial Uniform Land Use Review Procedure (ULURP). Indeed, that's one mini-revelation from Doctoroff. "Although we would eventually become masters of ULURP," he writes, "at this point not a single rezoning had been approved and internally we had doubts about pulling off all we were trying to accomplish. Because the state owned much of the land, we decided that for expediency we would skirt ULURP and take advantage of the state's seemingly speedier process. With twenty-twenty hindsight, I am positive we could have placated our opponents in negotiations and gotten the process through ULURP." He's got a point. The Bloomberg administration might not have placated all opponents -- many were opposed to the arena, period -- but likely would have made some concessions, leading to perhaps more legitimacy and more oversight for the project, as well as a voice for then-City Council Member Letitia James, who represented the area. A more important revelation from Doctoroff is that, while he and the Bloomberg administration were public cheerleaders for Atlantic Yards -- “My role in this was to be as supportive and reassuring as possible,” he writes -- from the start in 2003 he questioned whether such a complex project would work. Noting that developer Bruce Ratner had to buy the money-losing New Jersey Nets and navigate a complex set of approvals, Doctoroff “thought it was a crazy risk, but, hey, it was his money.” Actually, it involved public money too, as well as the opportunity cost of delaying alternative use for the public property at issue. After all, given how much Atlantic Yards was sold to the public as providing solutions to the affordable housing crisis, didn't public officials owe us more candor about the risks of delay and nonperformance? How long was Atlantic Yards supposed to take? That too goes down the memory hole. Viteritti writes that de Blasio "picked up the ball on real estate projects he inherited...he got Forest City Ratner, the developer of the massive Pacific Park Project...to accelerate the construction of 2,250 affordable apartments by 2025--ten years ahead of schedule." To clarify: by 2014, there was a new developer: Greenland Forest City Partners, the joint venture owned 70% by Greenland USA, with Forest City the junior partner. That's worth noting, because community critics seeking a faster timetable tried to pressure the state before approval of that new majority owner was granted. More importantly, "ten years ahead of schedule," while widely reported and not incorrect, is misleadingly incomplete. That timetable is ten years ahead of the previous schedule, which had been extended from ten years to 25 years. So a 2025 completion date remains well behind the long-professed timetable. In fact -- and this was public knowledge before the author's deadline -- that target date is now in jeopardy, given that the developer last November paused market-rate development. Doctoroff looks approvingly at Pacific Park so far, saying the arena opened "to (mostly) rave architectural reviews, with critics praising its proportions and its fit into the neighborhood." True, but critics' praise for the arena's innovative, elevator-based loading dock was followed by neighbors experiencing noisy truck lineups on residential streets. The former deputy mayor also cites an increase in property values and busy restaurants, and none of the "feared terrible traffic congestion." The latter is true, but he should acknowledge that congestion fears were based on a project that had been built out faster, as well as far more fans driving from New Jersey. Nor does Doctoroff acknowledge that impacts on the nearest residents can be brutal; one resident said she lives near "sh--show corner." He fails to mention that extravagant promises of local/minority/women hiring and contracting have never been confirmed. "Thousands of units of desperately needed affordable housing are finally coming online," Doctoroff writes. The total is actually 781, in three towers, with new construction paused, and it's doubtful that all of the units are desperately needed. After all, some 43% of the apartments built so far are aimed at middle-income households earning up to 165% of Area Median Income, far more than the income of the mostly low-income residents who marched enthusiastically for Atlantic Yards affordable housing. That translates, for example, into two-bedroom apartments costing well over $3,000 a month. In fact, though the two already open buildings drew more than over 176,000 aspirants in the city's housing lottery, the developer was unable to fill all middle-income "affordable" units, presumably because of cost. So those apartments are now open to anyone who fits in the appropriate income category. With affordable housing, the devil is in the details, though readers have no way of knowing from these books just how affordable the apartments are. Housing is called affordable if a household pays up to 30% of its income on rent. The Atlantic Yards story deserves more nuanced attention generally. Gonzalez, in a few glancing mentions, does the best job of suggesting something was sketchy; Viteritti and McNickle acknowledge controversy. Doctoroff claims success at a transformational project, scoffing at project opponents as brownstone owners wary of crowding, though he allows that we'll never know if Ratner makes money on the project. What's missing, though, is a sense of the political skullduggery involved. For example, both books about de Blasio cite his relationship with the community group ACORN and its New York leader, Bertha Lewis. But neither mentions how, when the national group faced an internal embezzlement scandal and funders pulled away, Lewis (as ACORN founder Wade Rathke acknowledged) got her Atlantic Yards ally Forest City to deliver a loan and a grant, further cementing their relationship. Also missing are issues of accountability, ones that will dog Atlantic Yards/Pacific Park during its next phases, inevitable twists, and likely requests for more government assistance. As the project's history is still being made, we should see its controversial past more clearly. Norman Oder is a Brooklyn journalist who writes the daily blog Atlantic Yards/Pacific Park Report and is working on a book about the project. On Twitter @AYReport. Ashley Cotton's June 22 Gotham Gazette op-ed “Tackling New York’s Housing Affordability Crisis” is deeply deceptive, part of the long-running spin from the developer of the Pacific Park (formerly Atlantic Yards) project. It's on par with the misleading mayoral press release June 13 for the "100% affordable" 535 Carlton, which I analyzed in City & State. Cotton, the External Affairs Executive VP for Forest City New York (and thus the spokesperson for the joint venture Greenland Forest City Partners), writes of that new building, "It’s 100 percent affordable, and proof positive that our public-private affordable housing model delivers great results." Really? Half of 535 Carlton is dedicated to middle-income households earning up to 165% of Area Median Income, or AMI. Translation: studios cost $2,137, one-bedrooms $2,680; two-bedrooms $3,223, and three-bedrooms $3,716. While those dip below market rates, they hardly supply housing to those who need it most. According to the Association for Neighborhood and Housing Development's Affordable Housing "Cheat Sheet," only 7.4% of New York households even fall within 140% and 170% of AMI, above which is clearly market rate. I recall the 2009 public hearing, where a member of the housing group ACORN urged approval of Atlantic Yards because "[t]he people in my building cannot afford $2,000 a month rent." They still can't. The word "affordable" sounds good, but vagueness about actual affordability obscures how affordability differs significantly from that originally promised, which got advocates like ACORN on board. Cotton writes, "We committed to delivering 2,250 units of below market-rate housing by 2025." Yes, but that obscures how the developer, with compliant public officials and cowed advocates, has delivered apartments for households in the top quartile of city incomes. The 2005 ACORN agreement was supposed to deliver 2,250 units of affordable housing, with only 20% of them -- 450 total -- going to the best-off middle-income cohort. Not only has AMI floated up significantly, this building has 50% of the units assigned to the best-off cohort. No wonder that I discovered, after analyzing the raw spreadsheet of applicants for City Limits, that while 92,743 households applied for 297 lottery units, only 2,203 applicants even fell within income eligibility for the 148 middle-income apartments among them. "For lottery winners, these units are life-changing," Cotton writes. Sure, for the woman Cotton features in her essay, who had been trying desperately to get good housing, and luckily won the lottery. For the relatively small number of those seeking the middle-income units, as well as the significant number of middle-income households who've actually turned down the housing after winning the lottery, it's not so life-changing. "Pacific Park Brooklyn," writes Cotton, "is already proof that putting affordability first can reap great rewards for the citizens of New York." Actually, it's proof that "affordability" is a great selling point when few look closely. The unfortunate but deeply important lesson of Atlantic Yards -- 13-plus years in -- is that the developer is always spinning. Those of us with long memories recall past deceptive essays by the developer. In May 2008, Bruce Ratner, CEO of Forest City Ratner (since renamed Forest City New York), penned an op-ed for the Daily News, contending, "for the first time, I am offering an updated construction timetable for the project...We anticipate finishing all of Atlantic Yards by 2018." Well, we know how that turned out. The timetable stretched to 2035, and then was said to be 2025, at least for the affordable housing, though officials at Ratner's parent company now hint at well past 2030. "We're still building the iconic Miss Brooklyn tower," Ratner wrote, regarding the Frank Gehry-designed flagship building at the intersection of Atlantic and Flatbush avenues, which would loom over the Barclays Center and contain an atrium in which arena attendees could gather. Now, of course, Gehry is long gone, and the Greenland Forest City joint venture -- surely wary of construction over a regularly used arena -- now plans to seek state permission to shift the bulk of Miss Brooklyn across the street. That would transform an already large approved tower -- replacing the current big-box stores Modell's and P.C. Richard -- into an enormous two-tower project. Consider the Feb 2010 op-ed from Ratner's deputy, MaryAnne Gilmartin, in the Commercial Observer. Atlantic Yards, Gilmartin wrote, "has been about jobs and housing and an historic community-benefits agreement that ensures that the project’s economic and social benefits help the folks who live here and need it most." Well, it's clear today that much of the "affordable housing," not to mention the market-rate housing, doesn't help those who need it most. What about that much-ballyhooed Community Benefits Agreement, or CBA? It was a huge part of project promotion, earning a press release from Mayor Bloomberg's office when it was signed in 2005. One significant part of the CBA, a pre-apprenticeship training program that was supposed to vault struggling Brooklynites into coveted union jobs, dissolved, leading to a bitter lawsuit. Other elements remained vague, unenforceable aspirations. Who oversees the CBA? Because it's not a government document -- Bloomberg was just a witness -- it's left up to the compromised signatories, which had neither the expertise nor the incentive to challenge the developer. As a consultant Forest City itself hired to evaluate the CBA concluded, the developer financially compensated the organizations for their potential to secure community support for the project, but not for their capacity to fulfill the CBA's programmatic goals. The CBA required an independent monitor. "Atlantic Yards is setting a new standard," Ratner asserted in March 2007, "and the ICM [Independent Compliance Monitor] will be everyone's watchdog to ensure we reach all of the goals and benefits we have agreed to." The monitor was never hired, despite a Request for Proposals. The developer saved at least $100,000 a year, and the CBA evaded scrutiny. I remember a November 2004 public meeting in which Forest City's initial Atlantic Yards point man Jim Stuckey, asked how the project would be overseen, replied, "The CBA we have in negotiation calls for an independent officer. Probably more than one." He even told the New York Times in July 2005 that the full project -- which was supposed to take 10 years when announced in 2003 -- might be completed as soon as 2011. That's the developer's record. Their statements, including claims of "Tackling New York’s Housing Affordability Crisis," always deserve skepticism. 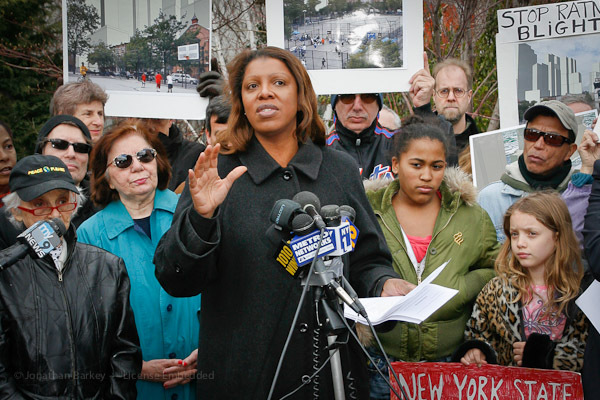 When Public Advocate Letitia (Tish) James served as City Council Member for the 35th District in Brooklyn, from 2003 through 2013, she was a vocal, high-profile opponent of the Atlantic Yards megaproject, as reflected in the 2011 documentary Battle for Brooklyn. James was a plaintiff in two lawsuits challenging the willingness of government authorities to relax deals with developer Forest City Ratner, and promoted another lawsuit filed by Brooklynites who went through a coveted pre-apprenticeship training program, run by a Forest City community partner, but didn't get expected union cards and jobs. In her successful 2013 campaign for citywide office, James even criticized mayoral candidate Bill de Blasio, generally an ally, regarding his support for the project, which includes the Barclays Center and 16 towers (of which four are now rising), set to house 6,430 apartments, of which 2,250 are "affordable." Since becoming public advocate, James, understandably, has paid far less attention to the project, which in 2014 was renamed Pacific Park Brooklyn after Chinese developer Greenland Holdings bought a majority stake, excepting the arena and one tower. 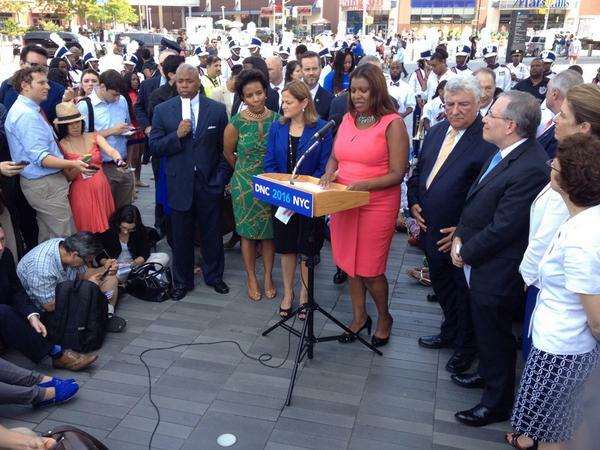 James also joined local officials calling for the 2016 Democratic National Convention to come to the Barclays Center. Still, it was surprising to learn, from New York Daily News Sports I-Team reporter Michael O'Keeffe, the main contributor to a four-part series on Atlantic Yards/Pacific Park that began April 11, that James would talk up the project at the behest of a developer she's long criticized. As O'Keeffe told it, at about 43 minutes into a podcast, published April 22, in which we both appeared, months earlier, as he began looking into Atlantic Yards,, he reached out to James, but was eventually told she didn't want to comment. As his publication date approached, and after the developer likely knew there was critical coverage coming about issues like sexual harassment by construction workers, low pay for arena staff, and neighborhood disturbances, O'Keeffe "got a call out of the blue" from James. While James told him she's not in touch with the grassroots, she said, as O'Keeffe put it, that "she doesn't really hear a lot of complaints from residents, what she hears is a lot of excitement about the possibility of affordable housing." O'Keeffe asked her if the developer - whose local face remains Forest City Ratner - asked her to call, and she said yes. On the podcast, I speculated that James was thinking about a 2021 mayoral run, as Atlantic Yards/Pacific Park criticism has less weight, and friendly relations with powerful developers can be helpful. But her posture - perhaps a lapse or poor political judgment - still seems strange. (She declined comment, in response to my queries.) Had James looked on my blog or sources like Atlantic Yards Watch or Instagram (see the #bciza tag), problems faced by arena neighbors have been amply documented. It's precisely her responsibility, as Public Advocate, to serve as a watchdog over the city agencies that have failed to curb, say, illegal parking or construction activities that spill out blocks from the project. While James understandably supports "affordable housing," the devil's in the details. James was critical of some of that housing, for example, challenging the developer regarding the percentage of family-sized units, lower than promised, in the first tower under construction, the lottery for which just opened up. She did appear at the December 2012 groundbreaking for that tower but was not quoted in any press release, and has stayed out of December 2014 and June 2015 press releases saluting two "100% affordable" towers. In other words, she had until recently kept her distance. Beyond a focus on her next campaign, perhaps James has been influenced by Michelle de la Uz of the Fifth Avenue Committee, a Brooklyn nonprofit, who was de Blasio's nominee to the City Planning Commission, and remains James' representative. That was progress, but de la Uz downplayed the fact that two "100% affordable" towers that came out of that deal skewed toward middle-income households earning six figures and were less affordable - in terms of incomes served - than the developer long pledged. De la Uz and allies in the BrooklynSpeaks coalition had actually once criticized that original configuration as not affordable enough. Today, de la Uz and allies likely have James' ear more than those bearing the brunt of Atlantic Yards impacts. But the Daily News series, as well as my coverage of a public meeting in mid-April, detailed continued frustration from neighborhood residents, as the harassment victim pointed out how state officials, in a report to an Atlantic Yards/Pacific Park advisory board, had downplayed the harassment. The developer did say it would roll out a color-coded ID system to make it easier to recognize construction workers. 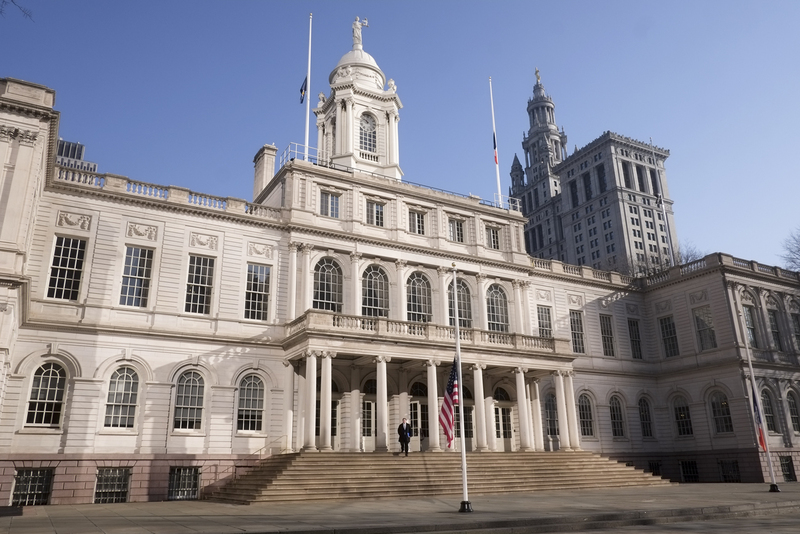 Similar political calculations may be at play for James's successor on the Council, Laurie Cumbo, who in the wake of the Daily News series was curiously silent. After all, Cumbo chairs the Council's Committee on Women’s Issues and has regularly spoken out about issues of sexual violence, including those affecting women and girls in Nigeria. During her Council campaign, Cumbo did criticize Atlantic Yards, but soon adopted a wishy-washy posture; she's regularly praised the below-market housing without reference to its actual affordability. Had a less powerful constituent than the Atlantic Yards/Pacific Park developer been connected to the harassment, I have to think Cumbo would have been less cautious. Though Cumbo did not respond to an April 18 request for comment, after she was informed that this article was in the works, she sent a statement Wednesday that, among other things, cited her work on women’s issues, including “legislation that will raise awareness to prevent sexual harassment and assault.” She noted that venues in the district had brought more traffic and thus quality of life issues, and that in recent weeks there has been “greater visibility on the need to address sexual harassment within our community.” She said that New Yorkers face “cat calls, lewd gestures, inappropriate language and unwarranted comments about the physical characteristics of their bodies” and that “in the City of New York, these acts will not be tolerated." Fewer than 90 minutes later, Cumbo circulated to her mailing list an announcement about the application process for 461 Dean, the first Atlantic Yards/Pacific Park affordable housing tower. Brooklyn journalist Norman Oder writes the watchdog blog Atlantic Yards/Pacific Park Report.